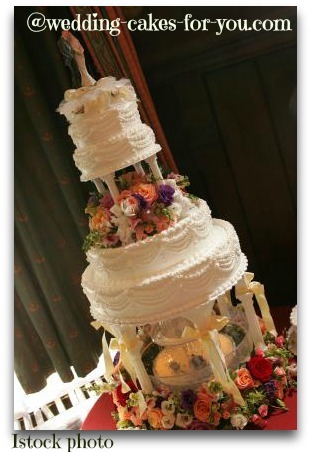 Do you prefer spectacular wedding cakes with fountains? How about a Las Vegas fountain wedding cake? If you like a little flash than this style may be right for you. Big fountain cakes like the ones on this page are quite dramatic. The water in the fountains can be colored, as in the pictures below, and are lit up with lights. 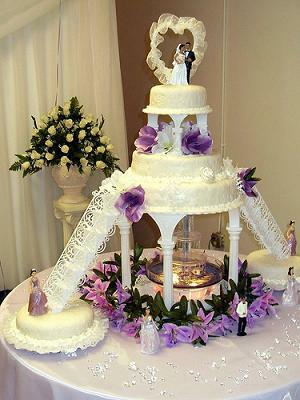 Special plates and pillars are used to house it and raise the wedding cake to spectacular heights. Fresh flowers, greenery, seashells, or even rocks can be used to surround the fountain and give it a more natural feel. The design to the left is a three tier wedding cake with a fountain.The wire and royal spray on top adds even more drama to this majestic Philippine style beauty. The flowers used to decorate this cake are made ahead using royal icing, wire and ribbon It is almost straight out of the Wilton book with a few changes. 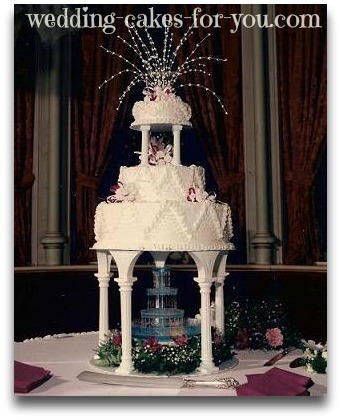 When first starting my business back in 1985, the Wilton wedding cake book was the decorators bible. You might think that this fountain wedding cake below was a Las Vegas theme wedding cake. But it was a Connecticut bride and groom who ordered this extravagant display, complete with the bridal party, and a crystal wedding cake topper. The water is colored blue, and flowers surround it. The bridal party placed their bouquets around the fountain, and the bride added the big white ribbons. With a table this large, it's important to add decorative pieces to balance the design. Another reason to add flowers and natural greenery or bows is to cover the plastic parts, which tend to be unattractive. 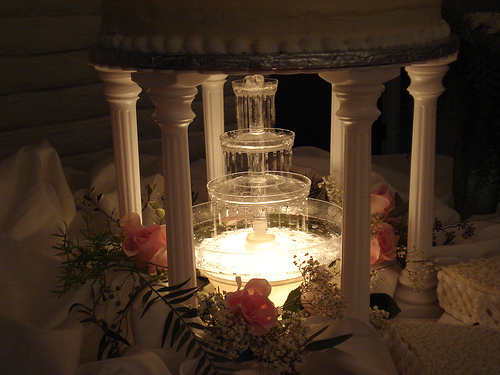 A beautiful example of a fountain wedding cake design. 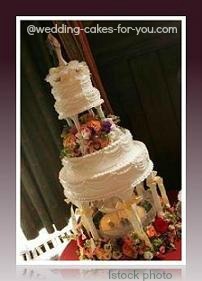 The bride and groom chose a fondant design, with filigree stairs by Wilton. A very traditional feel with what looks to be silk purple Lily's used for color and coverage. This is a close up view of the design that is pictured at the top of this page. The flower arrangements on this one are outstanding, full and very colorful. Your florist can provide you with flowers to match your bouquet, or if your on a budget, buy your own flowers at your local discount Costco or even a grocer's. Ask a family member, or your pastry chef to arrange the flowers around the cake for you. There are ways to save money if you are doing it yourself or a decorator on a budget. You can even rent fountains from your local craft shop sometimes. "There was a young couple at church getting married, they were on a tight budget. They came to me to order their wedding cake. They said they didn't have a lot of money to spend on the cake and so we came up with a simple design. 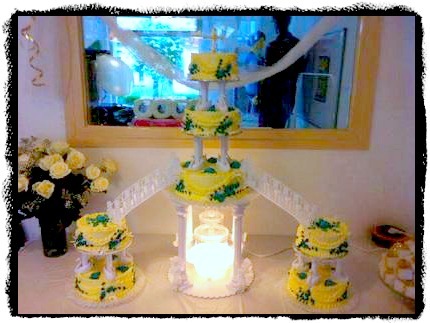 A friend of the bride had told me that the bride loves the old school style cakes, but she felt she couldn't afford one. Since I also love that style. I came up with a idea to surprise the couple! 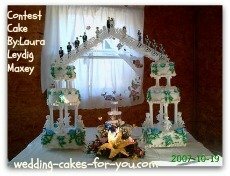 I made them a traditional wedding cake with the fountain and stairs. when they came into the reception venue and saw the cake the bride was so happy she cried and cried, it brought tears to my eyes!" 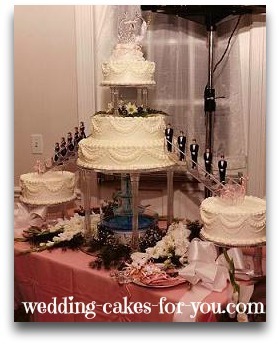 Click on the pics to see more wedding cakes with fountains from visitors.